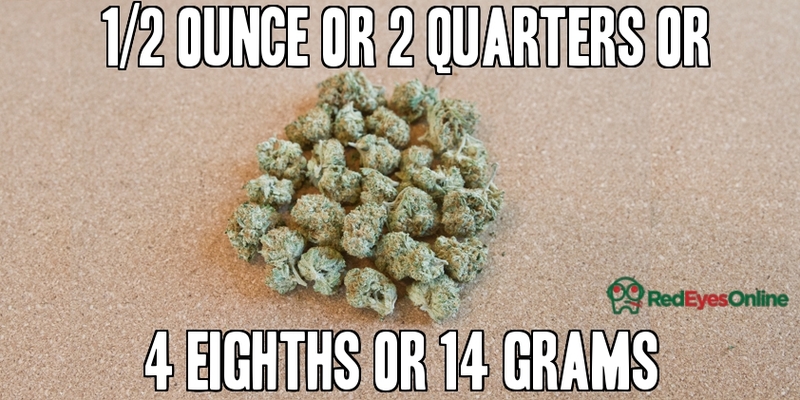 →How Much is a Gram, Quarter, Half Ounce and Ounce of Weed? Even the most seasoned marijuana smokers can sometimes get hung up on weed measurements. For the newcomers to this industry, it can often feel like you need a degree in mathematics to be able to properly express to the clerk at the dispensary how much weed you want to buy. Whether you need a gram, quarter, half ounce, ounce, or more, it might appear pretty confusing at first. The weed measurements are actually quite simple once you get your head around it, and this comprehensive guide will have you rattling off those measurements like a seasoned pro in no time at all. Although the dollar bill visualization information provided in this weed measurements guide will help provide a basic understanding as to the size of the stash, it is important to remember that certain buds like indica or sativa, have certain densities, so the weights and volumes vary. For this reason, investing in a digital weed scale is your best bet. Generally, this is the smallest of weed measurements sold at the dispensary, pretty standard when buying things like a pre-roll. After some time, you can spot the size of a gram very easily, typically covers up the image of the president on the one dollar bill. Depending on your smoking tolerance, a gram of weed will last a couple of smoking sessions or can be rolled into a single blunt or joint to back a power punch. When it comes to weed measurements, the eighth is ideal for those people who are smoking marijuana on a regular basis. The eighth distinction basically refers to the weight of the marijuana being one 1/8 of an ounce. Typically you are going to get better value buying an eight of weed than one gram at a time. An eighth of marijuana placed on that same one dollar bill will cover about one-third of the money. The quarter ounce of weed is typically referred to as the quad and comes in at seven grams in weight. This amount of marijuana will last you quite a while, perfect for that big party of if you are going to be laid up recovering from an injury for quite some time. 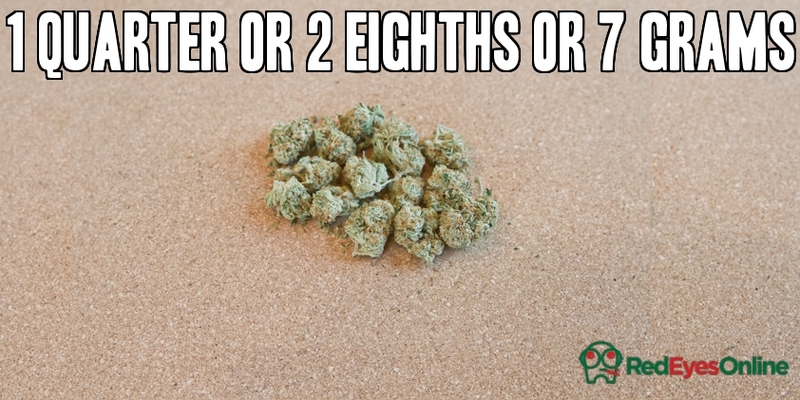 Buying a quarter ounce will limit your trips to the dispensary to re-up each week. The quarter ounce placed on that same dollar bill covers half the money. Now we are getting to the bigger quantities of marijuana. 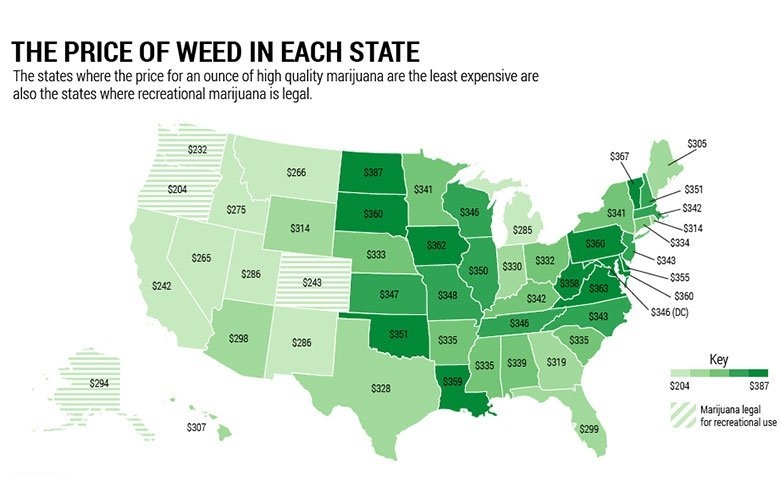 As far as weed measurements, the half ounce is pretty typical for the serious smoker who either is throwing regular parties or has a chronic illness that requires daily treatments. Placed on that dollar bill, the half ounce covers the bill completely and then some. 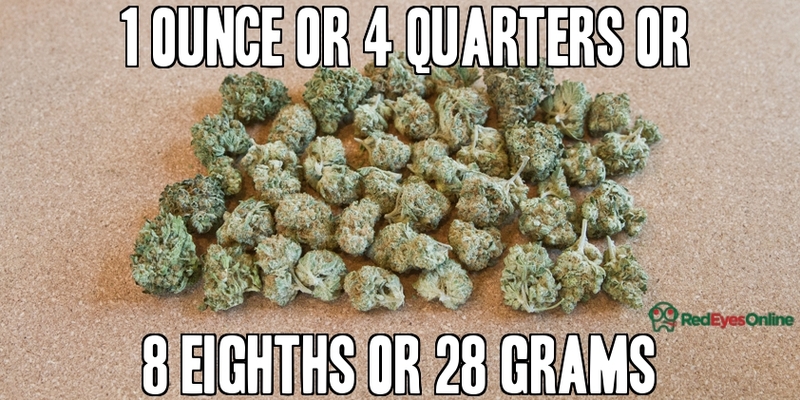 If you look at the quarter and half ounce by comparison, you can see how the math really is not that complicated as you move up to the heavier weed measurements. 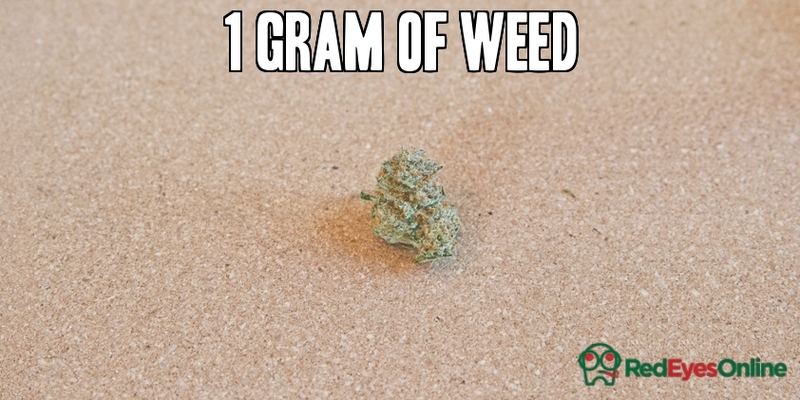 The ounce is also referred to simply as an O and very common at the dispensary. Once ounce of weed will cover the dollar bill three times over, plenty for stashing and having within arms reach at a moments notice. Just remember, when you have this much weed on hand to keep it in glass containers to avoid drying out. So by now, you got the hang of this weed measurements thing, but we will keep going just to reinforce how simple things get as we continue to stock up on our marijuana. Although we jumped right to the pound of weed, the math conversions are simple enough that you can easily figure out what a quarter and half pound measures out to. At this point, let’s just say you can cover that same one dollar bill over 30 times. 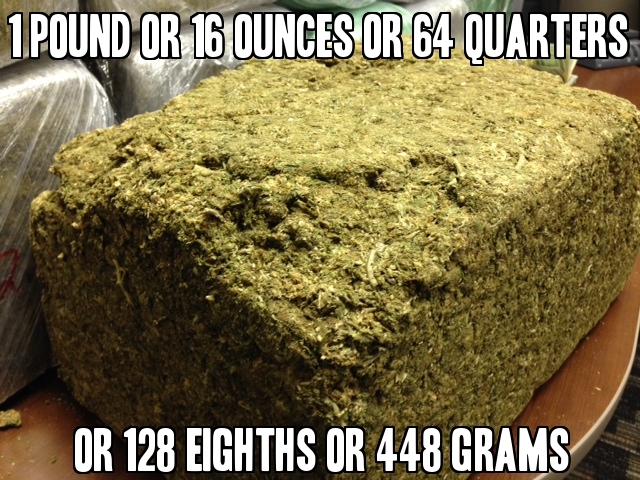 Just for a little overkill, if you are in the market for a kilo, kilogram of weed, then you will have approximately 1,000 grams of marijuana on hand! 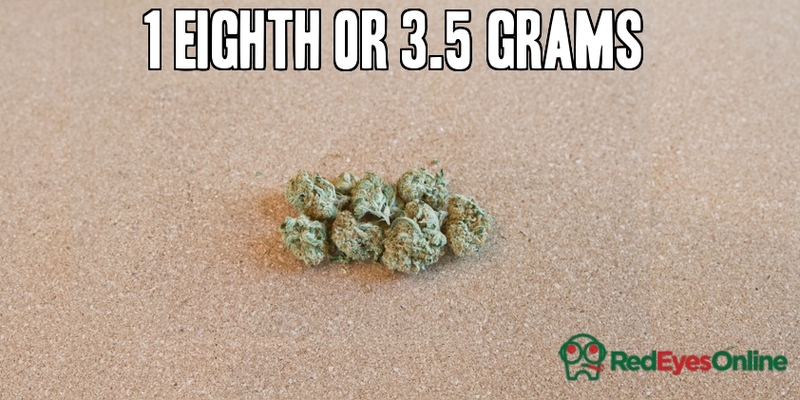 So by now, even if you are new to weed measurements, you should have a pretty clear understanding of the difference between a gram, quarter, half, and ounce of weed. Next to learn is how to choose best grow light, which you can learn here. If these numbers are still confusing, no worries, pick up a cheap digital scale and you will be sorting your stash like a pro today. You will need a digital scale because different buds have different density so the same weight doesn’t always mean it’s the same volume.